Aisling has been a full-time researcher on the Growing Up in Ireland Study Team since 2006 and is currently a Senior Research Officer. She leads the GUI Research Team on work with both the Infant and Child Cohorts including the development of questionnaires, training of interviewers, data analysis and preparation, and writing of Growing Up in Ireland reports. She has a special interest in ethics and child welfare in the research context. Her main research interests are cognitive development and parenting, and influences on development in early childhood. Aisling is currently Secretary of the Royal Irish Academy’s Social Sciences Committee and Policy Group Co-ordinator for the Society of Longitudinal and Life Course Studies. Aisling’s background is in psychology, and both her primary degree and PhD were completed at the School of Psychology in Trinity College Dublin. Her PhD research was in the area of cognitive psychology. Aisling also has a Diploma in the Psychology of Criminal Behaviour (NCI) and a Postgraduate Diploma in Statistics (TCD). 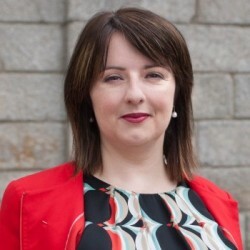 She has taught a variety of psychology and research-related courses within TCD, and her research experience includes work with Victim Support and the Central Statistics Office. See more about Aisling’s work and publications at the ESRI here.